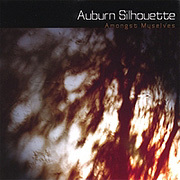 A deep and organic experience awaits the listener on Auburn Silhouette - nine tracks of well-crafted ambience that cannot be easily filed away under just one style. Deep drones and peaks of guitar ambience begin the disc in a meditative fashion, sustained by rushing wind, crunching leaves, and snippets of birdsong. On "Munstead Heath", a flurry of chiming bells breaks though, accompanied by sustained guitar chords that hint at a prog-rock explosion. The next track, "Hole In The Sky", follows through with a hazy five-minute jam of splashy drums and guitar. Elsewhere on the disc, tribal drums, ethereal voices and electronic sighs come and go in unhurried fashion over sibilant undercurrents of sound, creating warm and enveloping atmospheres for the patient listener. Evident all throughout is a sense of seasoned musicianship that demonstrates the musician's personality and makes all the tracks sit well together on one album. A cold and menacing atmosphere lurks around the edges of this music, but the disc's overall mood evokes placid reflection - a look at Nature in the midst of modern cacophony. Also included is a bonus DVD with visual accompaniment for three of the album's tracks - a superbly edited montage of whirling stars, wide deserts, spinning atoms and deep dark skies.